Great landscape lighting provides a simple, affordable way to create an alluring outdoor environment for your home. You can create an inviting entrance and great curb appeal with lighting in the front yard and a soft, cozy atmosphere for entertaining in the backyard. Whatever the style of your home, great landscaping lighting will enhance the overall beauty and appeal of your home and landscape. Balance is important when you’re lighting your home’s exterior. Lighting only the house can look unnatural and create an uninviting entrance, especially if you have a large front yard. It’s important to balance the lighting on your home’s exterior such as porch lights, wall washers and spot lights with interesting and varied types of landscape lighting. By up-lighting trees and shrubs, you will add depth and soft ambiance that creates a warm welcome for guests. To create an inviting entrance and a bit of dramatic ambiance for your front door, you need more than just an overhead or wall-mounted porch light. 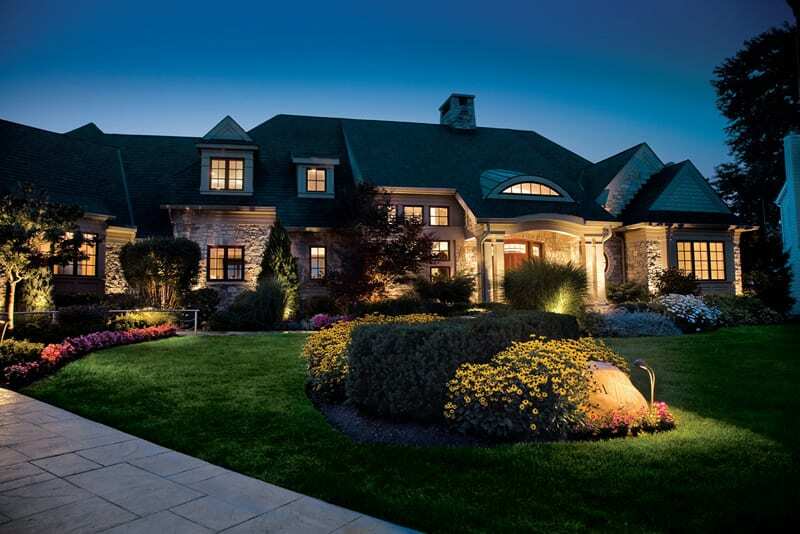 By using soft up-lighting and down-lighting around the entrance, you can add stunning appeal to your home at night. Soft highlights will add depth to your front entrance and lead your eye right to the front door. If your front porch has columns or pillars, you can back light them to create softness and emphasize shapes. It’s essential to illuminate walkways and pathways in your landscape for safe foot paths. Whether you opt for simple, inexpensive LED landscape lighting in Omaha or pricier fixtures with specialty finishes, placement is critical. When positioning pathway lights, think of them as gentle hints for where to go next, not tools to outline the shape of the walkway or pathway. Even with a long walkway, using fewer fixtures is better than using too many. When selecting pathway lights, look for fixtures that will add color and texture to your landscape. Pathway lights are visual aids in a dark space, but they can also add interesting color and texture to walkways and pathways, garden areas, patio perimeters and landscaping along retaining walls and fences. Choose fixtures that complement the architectural style and materials of your home and enhance the shapes and colors in your landscape. If you have an outdoor fireplace, outdoor kitchen, pavilion or pool house, spotlight features with landscape lighting to create dramatic appeal. You can use spotlights, floodlights or flexible LED lighting strips, depending on the amount of light you prefer. For vertical surfaces spots, floods and wall washers work well. For features with curved or flowing lines, flexible lighting strips can accentuate curves and softness. To create moonlighting effects, place fixtures high in the trees and aim them downward. The leaves and branches of the trees will cast interesting shadows on landscape areas, patio areas, and pathways below. To do so, place several lighting fixtures high up in the tree branches and cross the light downward. For the most natural appeal, fixtures should be placed 30 to 40 feet up in the trees and hidden from view. For the most natural moonlit look, moonlighting uses cool lighting that provides a blue cast. It’s very effective, but creates a rather cold, sterile feeling. In outdoor areas it’s important to mix warm lighting with a yellow cast to moonlighting.